PROPHECY HEADLINES.COM: "I Will Set Egyptians Against Egyptians"
Like a swift moving cloud, Isaiah predicts the rapid deterioration of events in Egypt. 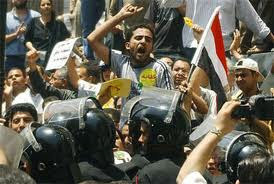 Civil unrest causes Egyptians to fight against each other. This fighting spreads from household to household and grows into a kingdom war. Probably quoting Isaiah 19:2, Christ warned kingdoms would rise against each other in Matthew 24:7. Unlike nation coming against nation, which alludes to world wars, “kingdom against kingdom” refers to regional conflicts. Christ taught these prophecies would come upon the world like birth pains. Like a woman about to deliver her newborn, these events are foretold to come with increased frequency and intensity each building upon the other. Rumors of regional kingdom wars presently abound in the Middle East. Egypt and Saudi Arabia reportedly conducted joint military exercises in 2010 preparing for a possible confrontation with Iran. Iran represents the Persian kingdom and Egypt and Saudi Arabia the Arab kingdom. Additionally, the apocalyptically minded president Ahmadinejad of Iran has threatened on several occasions to wipe Israel, representing the Jewish kingdom, off of the map. Psalm 83 predicts the Arab kingdom will someday rise against the Jewish kingdom to banish the name of Israel forever. Both Egypt and Saudi Arabia along with eight other Arab populations join the Arab kingdom in this pending prophetic war. Isaiah’s prognosis for Egypt worsens as you read the rest of his chapter nineteen. Isaiah 19:5-12 tells us unprecedented religious and economic strife plagues the nation according to the purposes of the Lord. Apparently, this disastrous condition befalls Egypt because of its future involvement in Psalm 83 since we read in Isaiah 19:16-18 that Israel will take over five cities in Egypt and cause Hebrew to be the spoken language inside their city limits. One of these cities will be called “the City of Destruction,” implying the I.D.F. destroys this city. Will the civil strife developing in Egypt cause the overthrow of President Hosni Mubarak, who supposedly has cancer and turns 83 on May 4, 2011? Many expected his son Gamal Mubarak to be his replacement; however, Gamal and his family have reportedly fled to the U.K. for safety. If the Mubarak government is overthrown will the Muslim Brotherhood fill his office with one of its own fulfilling Isaiah 19:4? The Muslim Brotherhood, presently banned in Egypt, hates Israel and supports Jihad against the Jewish State. Hamas, also participating against Israel in Psalm 83, is their political arm inside of the Gaza. Hamas, like the Muslim Brotherhood, calls for the destruction of Israel. Will the present protests inside Egypt metastasize into the fulfillment of Isaiah 19? If so will the coming cruel leader be the one who leads Egypt into the Psalm 83:6-8 confederacy? All of this is unknown but entirely possible. One thing is for certain; the Middle East appears to be on the verge of going apocalyptic. January 2011 has seen the governments of Lebanon, Tunisia, and Egypt become severely challenged. The government of Jordan is expected to be next. Lebanon, Egypt, and Jordan are involved in Psalm 83 and Tunisia appears to take part in the Ezekiel 38 & 39 prophecy. It appears high time Christians familiarize themselves with the prophecies of Isaiah 19, Isaiah 17, Jeremiah 49, Psalm 83, and Ezekiel 38 & 39. These are a few of the world changing prophecies stage setting on the prophetic horizon.